More V*, Dalvi P**, Panchbuddhe S*, Parulekar SV***. Adherent placenta is a not uncommon indication for emergency obstetric hysterectomy. We report a case of partially adherent placenta diagnosed intraoperatively during an emergency hysterotomy, which was performed for antenatal hemorrhage due to separation of a placenta implanted in the other segment. In view of intractable post-partum hemorrhage emergency obstetric hysterectomy was performed. Placenta accreta is a rare and life threatening condition with high maternal mortality and morbidity. Placenta normally is confined to the decidual lining of the uterus, but it may sometime invade the myometrium due to defect in decidua basalis. This condition is known as placenta accreta. It is a not uncommon indication for emergency obstetric hysterectomy. The incidence of placenta accreta is on rise due to increase in rate of cesarean section. A 26 year old women, married for 7 months, second gravida with 19 weeks of pregnancy presented to the emergency department with blood stained vaginal discharge for 10 hours. She had no other complaints. She had a previous one spontaneous abortion at two months of gestation for which dilatation and evacuation was done. She had no significant medical or surgical illness. On examination her vital parameters were stable. Abdominal examination revealed relaxed uterus of 18 weeks with positive external ballottement and regular fetal heart sounds. On speculum examination leak was seen. On vaginal examination cervical os was 2 3 cm dilated, 40-50% effaced with absent membranes and fetal lower limbs palpable. Ultrasonography was done which revealed intrauterine gestation of 18.3 weeks with severe oligohyadraminous (amniotic fluid index - 1). In view of premature prolonged rupture of menbrane with inevitable abortion, a decision for termination of pregnancy with oxytocin augmentation was taken. Injectable antibiotics were started. Oxytocin infusion was augmented as per uterine activity. She was reassessed after 24 hours. Clinical findings were similar to previous findings, hence decision for administration of misoprostol 400 microgram vaginally was taken. After second dose of misoprostol 400 micrograms per vaginum after four hours, she complained of vaginal bleeding. On vaginal examination findings were again similar to the previous findings with fresh bleeding of around 300 ml. Uterine rupture was suspected and a decision for exploratory laprotomy with hysterotomy was taken. Intraoperatively the uterus was of 18 weeks’ size, with ballooned out lower segment. There was no rupture. Transverse incision was made on the lower uterine segment and the fetus was delivered. The placenta was posterior reaching lower segment. It was partially separated in the upper portion and was densely adherent on the lower segment due to which it had to be removed piecemeal. Bleeding continued to occur from the lower segment. 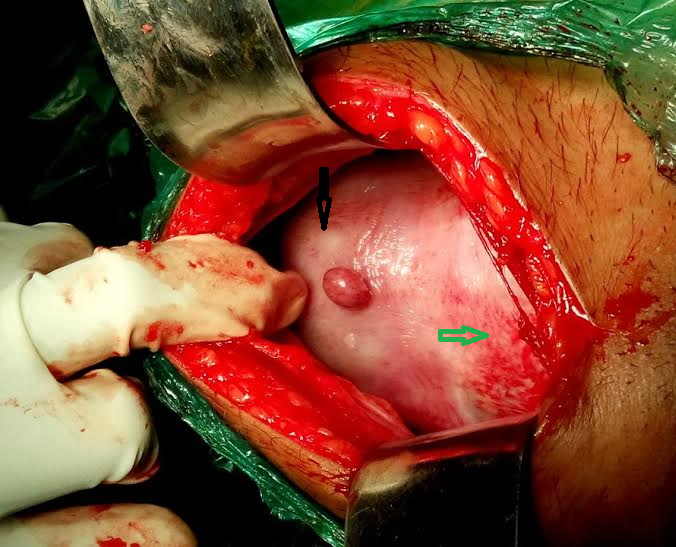 Multiple hemostatic stitches were taken on the lower segment and bilateral uterine artery ligation was done. Hemostasis could not be achieved. Total obstetric hysterectomy was performed in view of intractable hemorrhage. Intraoperatively three units of whole blood were transfused. Histopathological examination of the specimen showed invasion of the lower uterine segment endometrium and myometrium by chorionic villi. Post operative course was uneventful. Figure 1. Figure1: Black arrow upper portion of the uterus and green arrow distended lower segment of the uterus. A small subserous leiomyoma is also seen. The incidence of placenta accreta was approximately 1 in 2500 in the 1980s, 1 in 535 in 2002 and 1 in 210 in 2006. Placenta accreta is described as an implantation in which there is an abnormally firm adherence of the placenta to the uterine wall. Placenta accreta occurs due to defects in the decidua basalis causing the placenta to adhere to or invade the myometrium. It is further classified: accreta, in which placenta is adherent to the myometrium; increta, in which placenta invades the myometrium; and percreta, in which placenta penetrates the myometrium and serosa and it may be attached to the adjacent structure. Total placenta accreta/increta/percreta is one in which all the lobules of the placenta are abnormally adherent, while partial type involves only a few to several lobule - as was seen in our case in which only lower half was morbidly adherent. Defective decidual formation is commonly in the lower uterine segment over the previous cesarean section scar or after uterine curettage. In our case, the patient had an abortion in the past, for which curettage was performed. The incidence of adherent placenta is increasing because of increasing rate of cesarean section. Other risk factors for placenta accreta include advanced maternal age, multiparity, previous myomectomy, thermal ablation of the endometrium and uterine artery embolization. Partially separated adherent placenta causes intractable postpartum hemorrhage requiring emergency obstetric hysterectomy. In our case also emergency obstetrics hysterectomy was performed for intractable postpartum hemorrhage. Excessive bleeding in placenta accreta is either due to the involved lobule being pulled off the myometrium, or the lobule getting torn from the placenta. In most of the cases, placenta accreta is not identified till third stage of labor. Ultrasonography is only 33% sensitive in detecting placenta accreta. Magnetic resonance imaging is more accurate in identifying placenta accreta. Stafford I, Belfort MA. Placenta accreta, increta, and percreta: A team-based approach starts with prevention. Contemp Ob/Gyn April: 2008; 53(4), 76-8. Silver RM, Landon MB, Rouse DJ, Leveno KJ, Spong CY, Thom EA, et al. Maternal morbidity associated with multiple repeat cesarean deliveries. Obstet Gynecol 2006; 107(6):1226–1232. Zelop CM, Harlow BL, Frigoletto FD Jr, Safon LE, Saltzman DH: Emergency peripartum hysterectomy. Am J Obstet Gynecol May 1993;168(5):1443-1448. Lam H, Pun TC, Lam PW: Successful conservative management of placenta previa accreta during cesarean section. Int J Obstet Gynecol 2004;86(1):31-32.